Opening Event: October 12, 2018, 6 – 9 p.m.
Exhibition hours: Thursday through Saturday 2-5 p.m. CELEBRATING the end-of-the-EXHIBIT and the end-of-the-YEAR with a party and conversation. 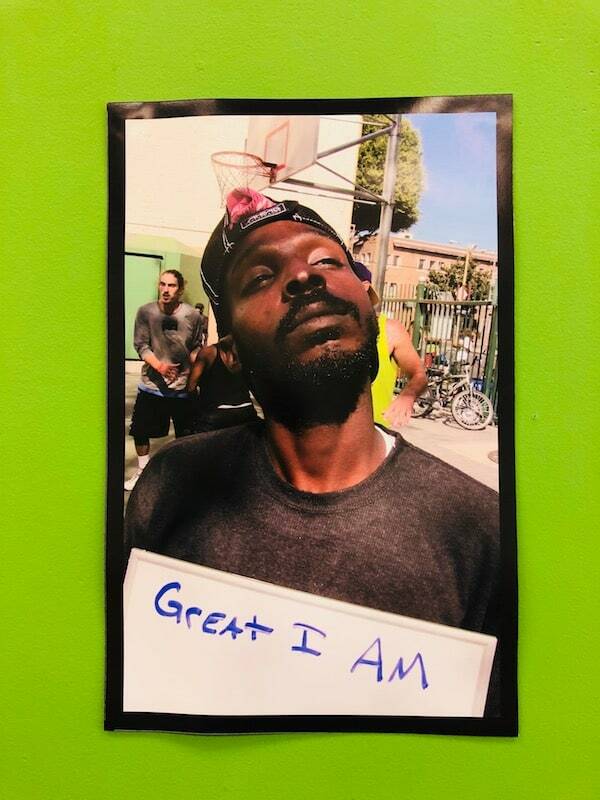 We are using the occasion of the current exhibition STATE OF THE ART: SKID ROW, which features 9 years of festival performer photos and comprehensive calendars of current arts activity in Skid Row, to have a conversation about the state of the arts in Skid Row — past, present, FUTURE. The conversation will feature artists Crushow Herring, Hayk Makhmuryan, Manuel Compito aka OG man, Leeav Sofer, Vijay Gupta and Henriëtte Brouwers, moderated by John Malpede. Come hear their thoughts, imaginings, perspectives and ideazzzz— and throw in your your own. * We’ll present the publication of the tabloid newspaper reporting on the 9th Festival For All Skid Row Artists, which we produced on November 3 and 4, 2018 in San Julian Park. * With performances by Lyrical Storm and Sir Oliver. * We’ll have food and soft drinks and make our own favorite dishes, please join us and add your own! Ten years ago Americans for the Arts partnered with Los Angeles Poverty Department to do the first inventory of arts in Skid Row. We convened the neighborhood and asked: who makes art, where do they make it, what supports do they have in making art, and what are the obstacles that artists confront in Skid Row. The findings were released in a study, Making the Case for Skid Row Culture, co-authored by Maria Rosario Jackson of The Urban Institute and John Malpede of the L.A. Poverty Department. In brief, the study found that art comes from the ground up in Skid Row, and that people make art wherever they can, in parks, in their rooms, in tents and on the streets. 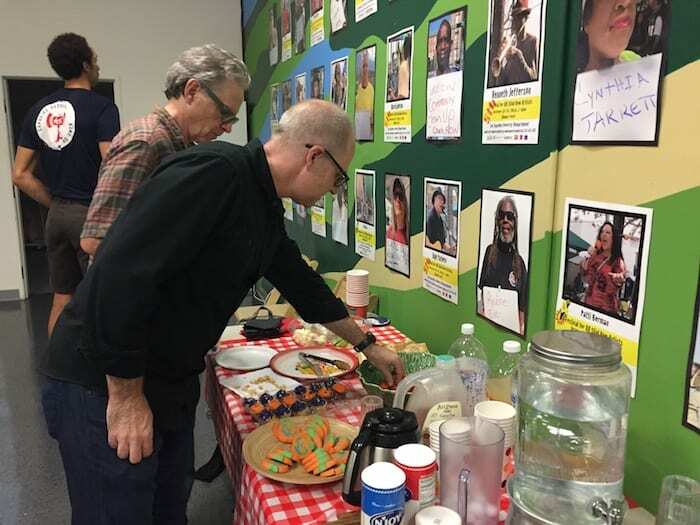 The obstacles included the lack of arts infrastructure—and the inaccessibility of the little infrastructure that did exist— with classes and workshops often restricted to clients of specific social services programs. At the time there were no dedicated art spaces that were accessible to the entire community. This exhibition checks in on the state of the arts in Skid Row ten years later. As a direct outgrowth of the inquiry the Los Angeles Poverty Department initiated, The Festival for All Skid Row Artists. The festival, now in it’s 9th year, will take place on Saturday and Sunday November 3 & 4. Each day features non-stop performances from Noon to 4pm as well as participatory workshops and the exhibition of visual art. LA Poverty Department maintains a registry of participating festival artists. The registry has recorded the participation of over 700 artists, a 130 of whom are identified in photos and posters on the gallery wall and in video’s in this exhibition. The Skid Row History Museum & Archive was started in 2015 as a dedicated community art space. It is the site of LA Poverty Department’s rehearsals and performances by LAPD and other groups, (including recent Street Symphony performances and an upcoming performance of The Urban Voices Project) as well as exhibitions, a film series, community conversations and meetings. It also houses an expanding archive of Skid Row history that is utilized by community members, journalists, and filmmakers, among others. Studio 526 Arts Center is a painting and music studio and is a project of The People Concern, (a large service provider). Importantly, the Studio 526 program is now open to, and enthusiastically used by the entire community. The Skid Row Parks Committee has partnered with the City Department of Parks and Recreation to produce a film series in Gladys Park & San Julian Park. LA Community Action Network, a leading human rights and housing rights group comprised of Skid Row residents, has purchased a building on 6th Street and it is the site of a number of cultural activities. Activities of all Skid Row Artists and groups taking place in October and November are listed on our gallery-wall-sized-calendar and adjacent to it is a map of Skid Row murals. While arts activity continues to flourish in Skid Row, some of the obstacles sited in the 2009 study persist. A convening of the neighborhood to reconsider current conditions will take place during the run of the exhibition. Skid Row History Museum & Archive programming, including this exhibition, is made possible with the generous support of The Andy Warhol Foundation for the Visual Arts.